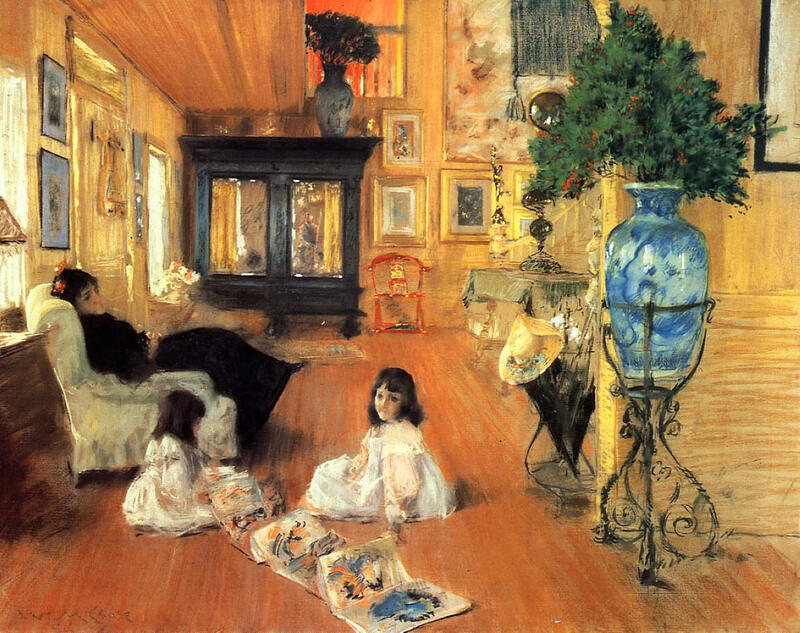 William Merritt Chase (American, 1849 – 1916) completed this lovely pastel-on-canvas work in 1892. Do you see him in the mirror on the armoire, a tiny self portrait of the artist at work? This artwork measures 104.14 x 81.6 cm, and it is held by the Chicago-based Terra Foundation for American Art. It will be on exhibit at the Museum of Fine Arts, Boston, from 9 October 2106 until 16 January 2017. On 10 February 2017 it goes on view at Cà Pesaro in Venice, Italy. Posted in Artwork, Big Picture | tagged art, artists, children, design, fine art, interiors, painters, paintings, pastels, people, portraits, self portraits, William Merritt Chase. The permalink.